What is it? For our last highlighted feature, we’re looking at the newly redesigned Measure Tool. One of the most common tasks used in the design process is checking the size and position of parts using the Measure Tool. 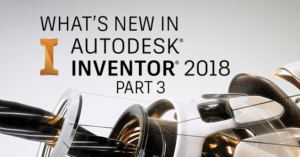 In Autodesk Inventor 2018, you can now select part and component priority within the dialog box and even dock the box in numerous places in your workspace, including the Model Browser itself. The process in which you measure is not much different than it was before, but now the dialog box includes much more information, including dual units if specified. Why I’m excited. 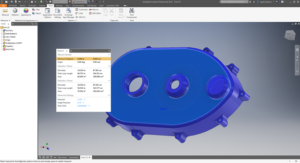 These improvements may not be as game-changing as something like MBD or backwards compatibility (AnyCAD), but they are most certainly way-of-life enhancements. The tool went from four different commands to a single toolset for all of your measurement needs. Being able to dock the Measure dialog box to the browser is going to save tons of clicks without having to use up precious screen real estate. Lastly, the dual unit function is a welcome addition to designers that work in a mixed unit environment. The updated measure tool was just one of the many improvements based on user feedback. See the measure tool in action along with the other user requested features added to Inventor 2018. Join the Autodesk Virtual Academy and never stop learning what new features are introduced to your favorite tools.